This undated postcard shows Castle Hill and Little Virginia, with the keep of Kenilworth Castle looming behind. An abundance of foliage has sprung up in the intervening years which means the castle itself is now obscured but the remainder of the scene is largely unaltered. 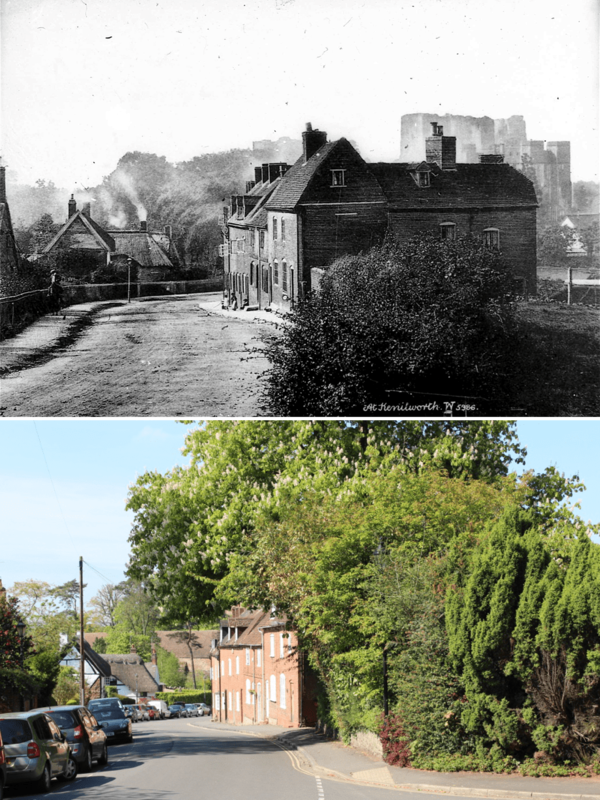 Obscured by the foliage (far right in the ‘now’ photo), is a modern house on the corner of Castle Hill and Elizabeth Way, which would stand in the way of the view of the castle today. Having lined up the equivalent aerial view on Google Maps I believe the white gable end visible in the distance (far right in the ‘then’ photo) was the end wall of the Queen & Castle, now obscured by a modern extension to the pub. Old maps of the area show this stretch of the hill labelled as New Row, although historically it was known as Bull Hill. There is a, possibly apocryphal, explanation for this name in connection to the Great Siege of Kenilworth and the events July 1266, when the papal legate Cardinal Ottobuono, wearing his red cope, excommunicated the rebels inside the castle. It is said that he delivered this Papal Bull of Excommunication from a safe vantage point at the top of Castle Hill which became known as ‘Bull Hill’. A more mundane explanation could be simply to do with nearby cattle from the drovers road or horn comb industry, in the same way that many towns have a Bull Ring or Bull Stake, sometimes with grizzly connections to the sport of bull baiting. Rob Steward explains in The Inns and Roads of Kenilworth (Odiborne Press, 2000) that New Row replaced the former Union Row, and that the lower stretch of the hill was once known as Clinton Green. Graham Gould expanded upon that in Kenilworth History 2011 following the discovery of some deeds: “Now it is possible to give the documented history of New Row from 1750, the time when both sides were fields except for houses on Bull Hill. Bull Hill is from 2 New Row to the east side of Malthouse Lane, a new road – this can be seen from the 1841 census. It can also be seen on the Deed of Inclosure 1756 which states “by the new intended Road leading from Bull Hill to the new Road leading from Odiborne Lane to Rudfin Lane” (the ‘new intended road’ is now Malthouse Lane and the latter road Beehive Hill). The only other properties at this time were on the other side of the road opposite Quarry Lane (the original name of Malthouse Lane), and Little Virginia. The road from New Row to the Ford at this early date was called Millbrook Lane”. Also in Kenilworth History 2011 we find a reference to a footpath, which still runs alongside Elizabeth Way, that was known as “The Craves (the ‘a’ is pronounced as in ‘halves’). 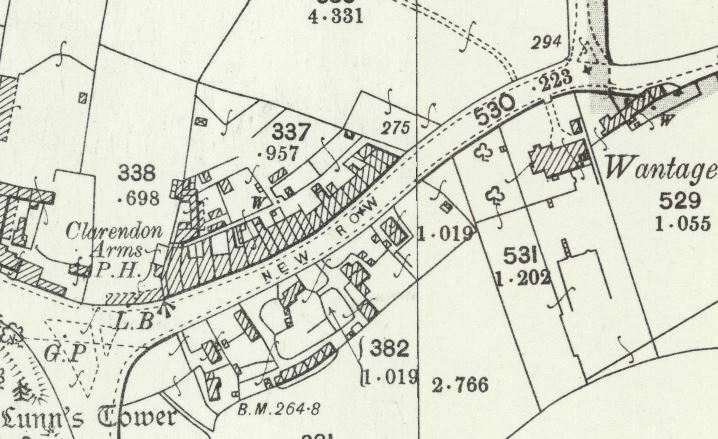 This is the path from Bull Hill (top of Malthouse Lane/Elizabeth Way) to Clinton Avenue, shown on the 1925 Ordnance Survey 25” map as ‘The Slack’. However, local people know this path as the Craves. In the English Dialect Dictionary ‘craves’ is defined as a ‘marshy place'”. Elizabeth Way, seen on the right of our ‘now’ picture, did not open until 1970.